Sometimes snails need to soar above the crowd! 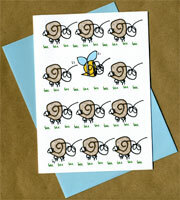 A cheerful Fast Snail bee buzzes above the baas of the Fast Snail sheep. Inside the greeting "Dare to be different" floats above another busy bee. 4 1/2 x 6 1/4 card is printed on heavy white card stock from sustainable forests and comes with a robin's egg blue envelope.